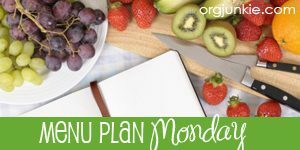 One of the best parts about blogging my weekly menu is that it forces me out of my meal planning rut. Most people don’t like to eat the same 6 meals over and over again, but it’s easy to fall into that rut over time. Knowing people are going to be looking at my meal plan is making me take a second look at how often I’m serving the same meals. Our breakfasts and lunches don’t change too much from week to week, and I’m okay with that, but I like for there to be more variety in our dinners, which isn’t always easy with picky eaters in the house!